Integrity isn’t the first word that comes to mind when you think of burritos. Chipotle is out to change that with a new marketing overhaul, Food with Integrity. Though they won’t be tampering with the tasty (and caloric) burrito recipe, they hope to alter the way American think about fast food and fast food advertising. burrito recipe, they hope to alter the way American think about fast food and fast food advertising. at the bottom of the screen, and The Chipotle supply chain appears. from other restaurant companies” the company’s chief marketing officer Mark Crumpacker said in a release. suppliers include pork from Virginia’s Polyface Farms, made famous by the documentary Food, Inc. and journalist Michael Pollan in The Omnivore’s Dilemma. 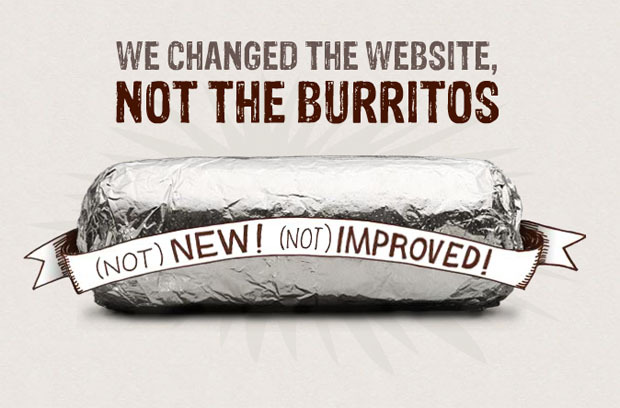 The new design includes erratic typeface, which tells stories of where burrito ingredients originated. (Did you know the pigs get to sleep in comfortable beds? Genius!) In stores, cups, bags and bowl liners tell tales from suppliers about the roots of the food. Customers can even submit their own stories online for a chance to be featured on the packaging. Even if you didn’t want to know where that chicken came from, you’re going to find out anyway. 1000th store opened in Texas in June.